After the weaning of my fifth son, my husband; who knew how overwhelmed, weary, and depleted I felt; gifted me a class from one of my favorite knitwear designers. The class was in Atlanta and I decided to ride the train. This gave me the entire weekend to myself. I stayed in a bed and breakfast and planned to spend the majority of my extra day at The High - a Leonardo Da Vinci exhibit was being advertised all over the city. In total I spent only about thirty minutes with Da Vinci - it was some of the smaller gems of the High’s permanent collection which captured my attention. I suppose that I thought my time away would be just that - a break in which I would not think about the kids, housework, or homeschooling. I was alone; nobody to converse with; and so I was granted a needed perspective to examine my mind and my heart. I suppose it’s no surprise then that the works that spoke to me most that day were all pieces dealing with the subject of motherhood. All three of the pieces I share with you are located in the Stent Family Wing which contains European art from the 14th to 19th centuries. I spent the first couple of hours that morning after viewing Da Vinci, just wandering through the gallery - examining, thinking, making a few notes and observations. During lunch I looked back over these notes. As I read I held the paintings in my mind’s eye, rearranged the pieces, grouped them and categorized them differently than they were displayed. Three pieces in particular tugged at my heart and I decided after lunch to go and visit each of them again. Why did they call to me so? I had a feeling that the Holy Spirit was teaching me about myself through these works. The first work was Maternal Love by Hughes Merle. 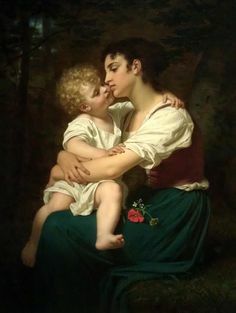 It is a very beautiful painting - a romantic, Utopian depiction of a youthful mother and a cherubic child. The child is captured on that fleeting day between infancy and toddlerhood - rosy cheeks over creamy skin; clean and neatly dressed in the heart of a sylvan forest. The child sits on his mother’s lap and it’s obvious that the title Maternal Love is an apt one - or is it? What unsettles me about this painting? I gaze at it and imagine the two other pieces displayed one on either side. What’s wrong with this picture? The child’s face is tilted up for his mother’s kiss but neither of them is looking at the other. Both of their gazes look emptily aside into the forest. The mother’s arms encircles the child; her hand clasps his arm as if to keep him or make him stay. One of the child’s hands looks as if it’s ready to push away - wanting down - the tilted cheek asking for her blessing to go, but he is kept; kept by her encircling and clasping. Maybe it is an innocent desire to keep him from harm or from getting dirty, yet my heart tugs. This fleeting age goes so quickly - gone almost before it arrives and it is natural to want to keep it and treasure it. Why then is her gaze averted? What holds her interest apart from her child? I know that longing - a mother who sees her own youth and desires just as fleeting as the days of her child. A mother who says, “Wait,” and expects him to remain just as he is - unchanged - until her gaze returns. I know this mother who longs for the freedom outside of motherhood. I meet her in the mirror some mornings. I go again and stand in front of the portrait that Samuel B. Morse painted of his wife and two children; Portrait of Mrs. Morse and Two Children. I sit right down on the tile floor and let myself be schooled by her. How much did Morse understand of what he was saying about his wife when he painted this piece? About her personhood and character? She cannot be mistaken for the sensitive, vacant, romantic mother of Merle. The setting of Morse’s painting is a noted contrast to Merle’s. Here is a family, in an interior scene reminiscent of a classical structure. Fatherhood is abandoned in Maternal Love but sitting on the hard floor I could feel the presence of Morse even though he is not pictured in the painting. He has painted a column directly behind his wife thus depicting her as steadfast in her role of motherhood. And yet she is not aloof from her children but rather accessible - in their midst - encouraging them to stand and explore on their own. The large expanse of sky which makes up the remainder of the background paints the freedom fostered in her motherhood. This is reinforced with her gaze - intent on her infant who is trying unsteadily to stand on his own. Even though he is perched atop a pillar, she supports him ever so slightly - only enough to keep him from falling - careful not to hinder his movement. The older child blowing bubbles is confident in her ability to amuse herself. She leans against her mother - perhaps to feel her strength or comfort. She knows she is free to play and explore and her mother’s attention will be there when she returns. I cross the gallery to the third work; a smallish statue displayed at eye level on a pedestal. A Woman of Boulogne Nursing Her Child by Jules Dalou. This mother holds her babe with the confidence of one who has had a long motherhood. This is not her first child. She holds her breast expertly with a knowing and willing nourishment and provision. A mother not in her youth who knows fully how fleeting and so eternal are all the days of her children. I love the details of this plaster carving - worn shoes, the sagging of an empty breast, the contentment of a well fed baby looking at his mother’s face with a sweet smile of contentment. I memorize her face, imagine her thoughts, feel her relief at sitting amidst her daily work to nurse her child. I ride the train home. The miles are slow and I savor my last moments of solitude before I dive headlong back into my own motherhood. Years later and now with a sixth son, the days still rush by. I react instead of act and I remind myself of Mrs. Morse and her column of motherhood. I still occasionally find myself saying, “Wait, wait,” and expecting their time to stand still until my gaze finds them again. I so long to connect day with day the active presence and the setting aside practiced by A Woman of Boulogne. I daily fail, but these artworks - my own triad of motherhood - have become residents of my imagination. And so even now in my falling short, I fall closer than before I knew these three women.